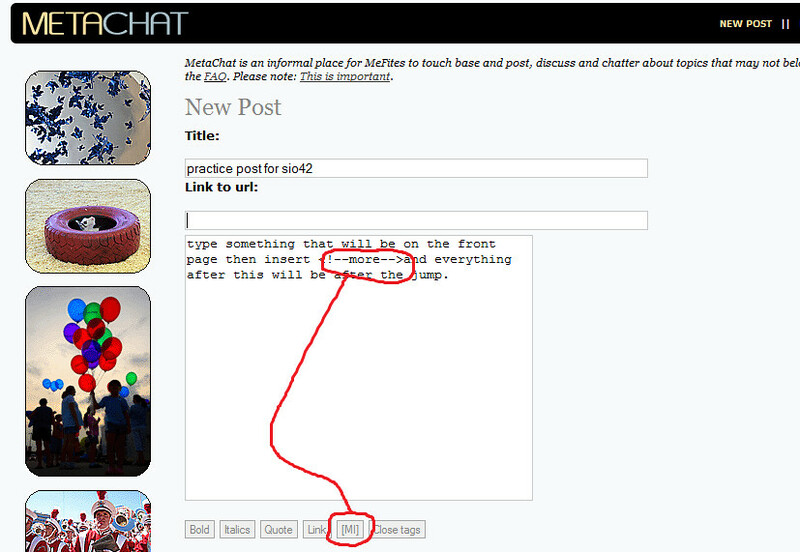 How to make a "more inside" when you make a post →[More:]This is an example that I sent to sio42 a while back. If you really want to make it more idiot proof, try spelling out "More Inside" on the button. Well, ain't that a trick! I briefly got very confused but I am fine now. Right now, it's not even reasonable-user-proof. But, I would say that. Discovered this by my sure-fire "What's this button do?" methodology. I learn a lot this way, but clean up my fair share of messes when things go all pear-shaped on me. Yeah, reading back a little, I didn't mean "idiot" exactly, but spelling it out would help I think. What? Y'all didn't know that? Ok, I didn't either until gaspode emailed me. I just made a post yesterday that should've done the more inside thing: my total text was too long for the front page. From now on I'll know what to do. (Should've read this first!) But thanks for doing it for me, MeCha mods!